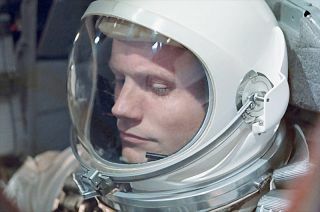 The life of the late astronaut Neil Armstrong is the focus of both a feature film and TV miniseries now in development. This review first appeared in the Fall, 2005 issue of Ad Astra magazine. Neil Armstrong's historic first footfall--by an engineer, not a scientist--onto another celestial body took place on July 20, 1969. It was a communal global event that underscored humanity's ravenous quest to explore new horizons, while becoming the technological high-water mark for the 20th century. And as the future unfolds before us, the story behind the first landing of humans on the Moon remains a saga of human spirit, engineering expertise, and the gutsy risk-taking that paid off in the end. That being said, Armstrong himself has long been enigmatic in recounting his most private of reflections regarding this seminal episode in space history, and the behind-the-scenes drama surrounding the most important "step" in human space exploration. Arguably, Armstrong over the decades has been a cloistered super-hero of space; his post-landing point of view missing-in-action. There are many that--for whatever reason--pigeonhole the moonwalker as an aloof, introverted Howard Hughes-like eccentric. I was fortunate in the 1980s to have worked with Armstrong. He was a valued member of the National Commission on Space (NCOS), a U.S.-government sponsored futuristic look at America's ongoing commitment to pioneering the space frontier. As part of the staff for NCOS, I can testify that, yes, Armstrong is quiet, reserved and soft-spoken. But that demeanor is a soft shell for his passionate and intense professionalism, and above all his steadfast determination to tackle tough problems. Anybody that has a one-on-one rendezvous with Armstrong can see why he was anointed by NASA higher-ups as best suited for the First Man job. In full disclosure, I add that Armstrong is on the board of Imaginova Corp., the parent company of SPACE.com, for which I am the Senior Space Writer. First Man: The Life of Neil A. Armstrong (Simon & Schuster, 2005 848 pages, $30.00 cloth) is a blunt and frank look into Armstrong's personal trajectory that catapulted him into hero astronaut status. This book is the first-ever authorized biography, masterfully written by James Hansen, a professor of history at Auburn University in Alabama. The volume is a product of new interviews with Armstrong himself, his immediate family--including his former wife of 38 years and his current wife--along with countless colleagues spread across the United States. Don't jump right into Apollo 11's triumphant touchdown on the Moon because you'd only be cheating yourself as a reader. That section, roughly halfway into the volume, is spectacular in detail, and replete with viewpoints regarding the controversial "first out" decision concerning the Eagle lunar lander (Armstrong or Buzz Aldrin? ), but you have to take your own walk back into Armstrong's past to best understand the person who took that historic first step onto the Moon. In a chapter titled "Amiable Strangers"--a term coined by Apollo 11's Michael Collins--Hansen skillfully details the background of each crew member. This famous trio, given the distance they covered to get to the Moon, is described as having a distinct and distant relationship between each other in contrast to other Apollo crews. For Armstrong, in tongue in cheek fashion, recollects it as simply a Navy guy getting along with his two fellow Air Force astronauts. From a kid who took his first airplane ride at about 6 years of age to a test pilot, and then an astronaut--Armstrong is shown first and foremost as an aeronautical engineer. Armstrong, in the mid-to-late 1950s, flew some of the most hot-shot, high-performance and risk-laden aircraft the country had to offer. That roster of craft included the X-15 rocket plane, where he tackled that vehicle's flight control system. Armstrong also served as a civilian consultant to the military's hoped for--but later cancelled--DynaSoar space plane. Hansen does a first-rate job of handling both the tragedies and triumphs of Armstrong's life. In some cases, there is a drawing back of the curtain as to the astronaut's own ability to cope with personal and not so personal issues. Still, there remains guarded insight that even Hansen could not extract from the moonwalker. The author delves into the heartbreaking loss of Armstrong's infant daughter to a brain tumor, the death of fellow teammates in the horrific Apollo 1 on-the-pad accident, and his own close-call with death when he ejected from an out-of-control Lunar Landing Training Vehicle. Ironically, Hansen writes, the first man on the Moon was a week late in submitting his astronaut application. Only through the intervention of some well-placed associates did the tardy application make its way into a pile of astronaut hopefuls. In fact, Armstrong says that the appealing part of becoming an astronaut was not so much shooting for the Moon. Rather, flying in a completely new medium was the attraction, he relates. And as the Mercury single-seat space capsule program drew to a close, Armstrong made the astronaut cut, and was selected to be one of the "New Nine." Three and a half years later, in March 1966, he commanded Gemini 8 with fellow astronaut David Scott. That mission was cut short by spacecraft problems, which approached near calamitous proportions before it was finally aborted. A stuck thruster on the Gemini spacecraft had put them in a spin so fast that they could have lost consciousness, but Armstrong pulled out all the stops to regain control. It was a lifesaving action, but one that the future moonwalker now recalls having worried both Gemini 8 astronauts about jeopardizing their chances for future flights. The fallout from the short-lived Gemini 8 flight is detailed by Hansen thanks to Armstrong's recollections--including his counter to criticisms from other Apollo astronauts about his rapid decision-making that curtailed the Gemini 8 mission. As pointed out by Gemini and Apollo astronaut, Frank Borman, the public wasn't privy to how close Gemini 8 came to out-and-out disaster--ranking as an Apollo 13-like crisis, but not as time consuming--with judgments made by Armstrong and Scott seen as justified given the situation. While many books have been written about the Apollo program, and specifically the touchdown of Apollo 11's Eagle on the Moon, Hansen has written a fresh, exciting and still finger-biting tale of how the first astronaut-landing on neighboring Luna was achieved. It remains an amazing story. Armstrong recounts his manual touchdown, drawing upon his piloting abilities while finding out in real-time that the lunar module flew better than he expected. In cool, matter-of-fact prose, he relates eyeing a layer of curiously moving lunar dust--the product of Eagle's thrusting decent engine--and not being panic stricken about rapidly diminishing fuel reserves. Armstrong's reminiscences add new vibrancy to an adventure that occurred over three decades ago, especially when he describes how he guided Eagle in for too light a landing. Later Apollo missions would purposefully land harder. Eagle's helicopter-like touchdown resulted in the Apollo 11 moonwalkers having to jump far up and down the ladder affixed to the lunar lander. Furthermore, readers will be delighted to learn of just how that priceless one-liner--"That's one small step for man, one giant leap for mankind"--truly came to be, with Armstrong still bemused about that apparent missing "a" that was seemingly lost in Moon-to-Earth translation. He admits that he's not particularly articulate, hoping that history grants him a little leeway if he indeed did slip up! Even as the dust settles on the retelling of the grand steps taken by Armstrong and Aldrin on the moon--while Collins remained in lunar orbit--the author moves quickly into the "astronaut as icon" years. Here the reader learns just how such fame plays havoc on the personal reentry into society of being the "First Man." Following the Moon landing and in departing NASA in 1971, Armstrong was offered plenty of private-sector opportunities--but remained hungry to stay in engineering, taking on a professorship at the University of Cincinnati that lasted some 8 years. Later he became engaged in several different corporate involvements, as well as promoting charitable causes in and around his state of birth, Ohio. First Man readers will find Armstrong's recollection as Vice Chairman of the Rogers Commission that investigated the Challenger accident quite telling, given the subsequent Columbia mishap. The book closes with a look at Armstrong's more recent years, including a heart attack, a rejuvenating remarriage, and a variety of outgoing and public activities into 2005. In his acknowledgements, written in April 2005, author James Hansen wraps up First Man by first thanking Armstrong for his full and generous support, which was a key element in Hansen's technically accurate, scholarly yet independent and accessible biography. This is a treasure trove of a book infused with new factoids and clarifications that deserves reading. I found this book a delightful read. While there is a handy guide to abbreviations used--space history tales are filled with them--a general, not so sophisticated space cadet, should find the book a captivating journey. For the true space aficionado, there are meticulous notes for each chapter, showing Hansen's careful research skills and attention to detail. Additionally, there is a bibliography of primary and secondary sources, archival collections, and other documents used to write First Man, as well as lists of interviews conducted. The book achieves what its author set out to do: provide a penetrating look into the most celebrated astronaut in history. James Hansen explains that he gave the "Armstrong project" his absolute best, for the reader, for posterity, as well as for Neil. Indeed, mission accomplished and a perfect touchdown. Leonard David is the Senior Space Writer at SPACE.com and a former editor of Ad Astra magazine.